Developing in WordPress is a lot of fun for me and there are great plugins that make developing and debugging WordPress code really simple. Debug-Bar, Debug-Bar-Extender and Debug-Console are my favorite WordPress plugins to do this. But if you really live in WordPress code all day long you might sometimes wish that you can just log into it and do your thing without the need of leaving test scripts all over the place. You can do this with wpshell, a tool written by my fellow Automattician Apokalyptik. Although this is a fairly unknown and well hidden piece of code it’s worthy to install it on your local development environment in order to dive right into WordPress. After adjusting some basic configurations wpshell gives you a command shell that accepts native PHP code as well as all the functionality your regular WordPress install would give you. And there is even more, it also parses all the tokens and lets you grab information about function definitions, their parameters and the like. If this got you excited go ahead and watch this video showing wpshell in action and how it is installed. If you did everything right you should now be able to use the shell. Here are some basics. That’s all nice, but what can I do with it? – The sky is the limit. I personally use it like this; I wrote a small Coda Plugin that takes selected content and executes it in wpshell and throws the result back to a new tab in my editor. In this way I can just mark code fragments or queries and run them against wpshell right away. I also created a small PHP script together with an AppleScript that allows me to search for a function and open the file it’s defined in directly in Coda and jump to the correct line or alternatively perform a php.net manual lookup and display the result in Coda. If there is any interest I can make these scripts public as well. They are still very edgy though. I also have a wpshell running inside a screen session and keep it always accessable via TotalTerminal. I did not have much time to look into it, but the code is so awesome that I hope to integrate it better in my IDE. 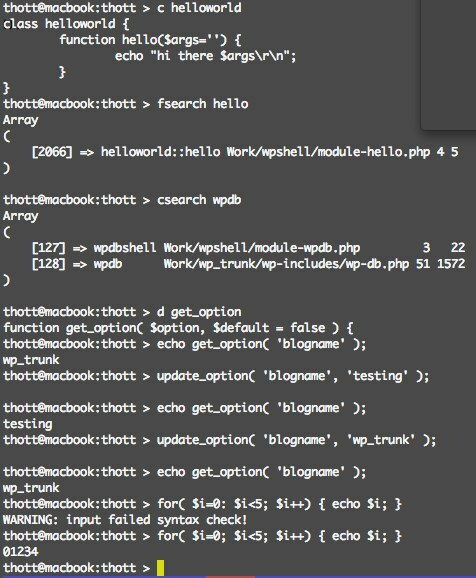 I’m planning to setup the parameters in wpshell-config.php automatically when I fire up a wpshell from within Coda. It would traverse upwards from the opened file until it finds a wp-config.php and setup HTTP_HOST and path accordingly. It could also work by simply entering a URL and Coda would fire up a preview window in Chrome along with the wpshell adjusted to exactly this url. Seems interesting to try. Any idea if it can run on Windows? Seems to be set up for usage via bash.